The 10 Mistakes of Raising Chickens! Raising chickens can be a very rewarding process. Besides providing you with fresh eggs, it can also be a teaching resource for your children and a way for you to become self-sufficient. 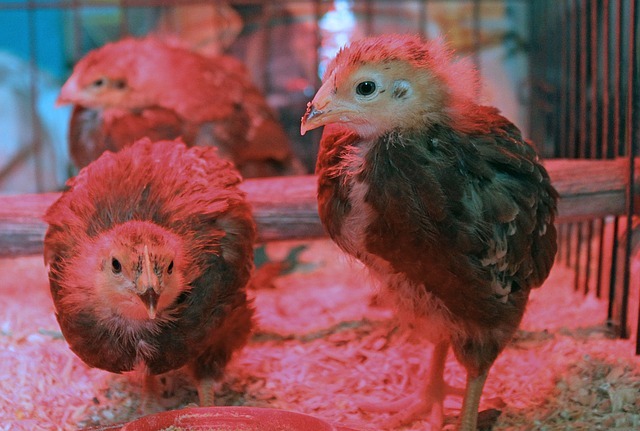 However, there are a few mistakes that people make when they first start raising chickens. Check out this list below and add your mistakes at the bottom to help others learn. Many first timers will create a hen house directly on the ground. They figure that the chickens will be able to peck for worms or that cleanup will be a lot easier. 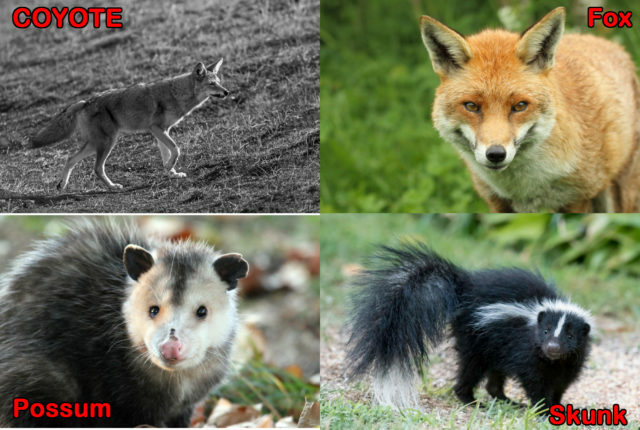 However, having a chicken coop on the ground can allow for foxes or other predators to work their way into the house. If there is an underground hole that you don’t know about, you may continue to lose your chickens. Instead, build a raised chicken coop that sits off the ground. Many people even incorporate removable or swing-away floors that allow for easy access cleaning. Some larger chicken coops allow you to walk inside and collect your eggs. However, this can pose some problems. Going into the chicken coop might result in tracking chicken poo all over the house or intruding on the chickens while they’re looking for an available laying box. Instead, create outside access boxes that you can grab the eggs from the laying boxes without disturbing the chickens as they walk around the hen house. This will also keep your shoes a little cleaner. Determine what feed you will have for your chickens. It’s recommended that you get poultry feed and get feed with added protein during the colder seasons. Chickens also like fresh and dried worms, white grapes, pomegranate seeds, raspberries, chard, brussel spout leaves and cherry tomatoes. 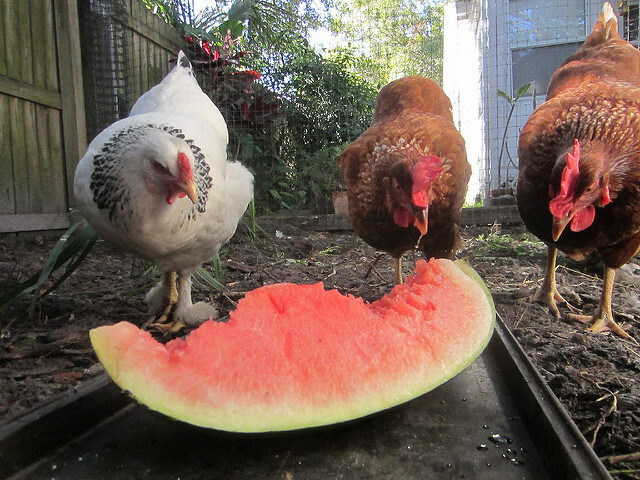 When the chickens begin to start laying eggs, they will need more calcium in their diet. Usually feeding them a few oyster shells will do the trick. Depending on where you live, you’ll need to maintain a certain temperature inside the coop. If you install a heating lamp, make sure that it’s high enough that it doesn’t overheat the chickens or burn the shavings on the floor. Usually a 250 watt bulb will be warm enough. You’ll need to collect eggs frequently during the winter too because they will tend to freeze. A chicken can go a few days without feed, but they can’t go very long without water. Many first-timers just add a bucket of water into the coop that is tall enough so that the chickens won’t play in it and is heavy enough not to tip over easily. 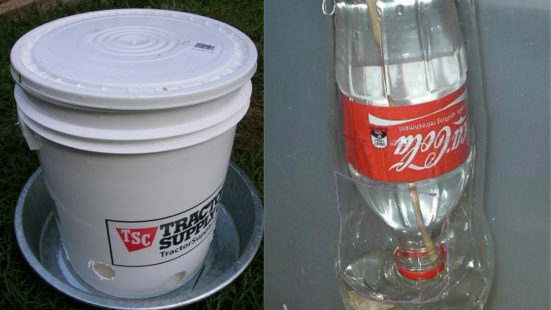 However, this encourages the birds to jump on top of the bucket and drink straight from the top – making it easier to tip over after a while. Consider using a hanging water source – called a waterer or a fount. This creates a trough, preventing the birds from sitting on the top. The ideal ratio of roosters to hens is 1:12, depending on the nature of the rooster. If you have a lower ratio than that, the rooster may get too aggressive with the hens. If you have a low ratio you’ll notice that your hens will tend to have bald spots on the back of their heads and featherless patches on their backs. If they’re over-agitated, hens’ egg lying will become sporadic. Many people like the idea of free-range chickens. However, this may not mix well with urban homesteading. You may need to plan against passing pets – especially dogs on leashes. Don’t assume that owners will stop their dogs or be able to keep them on a leash. You’ll need to have some fence or security in place for passing dogs. Previous Article Pros & Cons About Keeping Marans Chicken!! !